Capcom’s release of the Mega Man Legacy Collection combines the Blue Bomber’s early adventures in one impressive package, complete with leaderboards and a gallery of original artwork for fans to enjoy. The collection includes the first six Mega Man games of the 8-bit era, which haven’t lost any of their old school challenge or appeal and remain a masterclass in sidescrolling platformers. The games themselves have never looked better, retaining their old school charm while being enhanced in glorious high definition. The sprites look clean and crisp, the framerate is steady and the action plays out just like it did on my old NES. While the game can be played with a keyboard, controller support enables you to play it the way it was meant to be. The controls are precise and responsive and in a game like Mega Man 2 where the smallest mistake means failure, the importance of this cannot be stressed enough. The included database is a Mega Man fan’s dream come true. Featuring artwork on every classic enemy in the first six games and the option to battle any of the Robot Masters whenever you like. 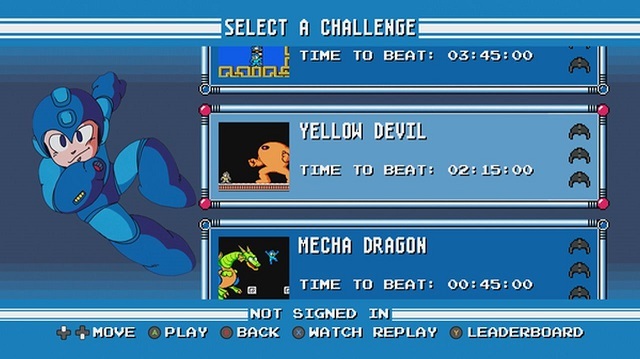 The challenge modes offer various remixes to the games, preserving the challenge of the originals with new ways to progress, sometimes combining levels of two different games to deliver a new experience. Even without the bells and whistles included in the collection, the core Mega Man games hold up beautifully. Each game offers textbook examples of level design, boss fights, and game progression. Doing away with the old password save system, the Mega Man Legacy Collection introduces a restore point system making it easier to jump into the action and tackle a boss fights or a particularly difficult platforming segment without having to restart the whole level. Of course, if you would rather preserve the challenge of the original classics you can ignore this quicksave altogether. Whether you are a returning fan or looking for an experience similar to Shovel Knight, this collection has a lot to offer. The core gameplay has not lost it’s potency with age. For those looking for old school challenge or experience the definitive version of the early Mega Man classics, look no further than the Mega Man Legacy Collection. While the backtracking can be tedious and the exploration can be maddening, Hollow Knight is still worth a look to anyone looking for a great action platformer. Hollow Knight wears its inspirations on its sleeve and reminds the world that sometimes you don’t need to create completely new mechanics, sometimes you just need to make those old mechanics shine again. The few modest upgrades serve casual fans, and the challenges offer veterans something to chew on. While I would have loved to see more new features and additional games like the oft-forgotten spinoff Mega Man and Bass, a package of four solid action platformers is enough to make Mega Man Legacy Collection 2 desirable to both fans and newcomers. Capcom may not be wholly interested in greenlighting a modern interpretation of Mega Man, but the collection is a great opportunity to experience video game history - if you haven't already. However, if you’re looking for a challenging but less frustrating platformer, just play Mega Man instead.